There Goes the Neighborhood: Los Angeles is a new podcast from KCRW and WNYC Studios. The series will dig into how Los Angeles has gone from the place to chase your dreams to one of the least affordable cities in the country. Housing prices are soaring, developers and landlords see opportunity, and many longtime Angelenos are getting squeezed out. You're invited! 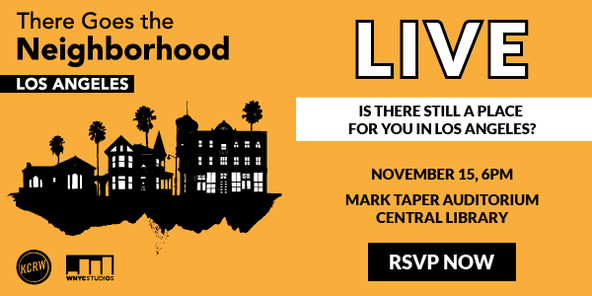 Come out to hear a lively discussion of solutions to L.A.’s housing crisis. Why is this happening now? Is it possible to build our way out of the problem? Can anything be done to avoid L.A. becoming as expensive as San Francisco or New York? In the L.A. of the future, can you find a place to call home? KCRW's Madeleine Brand will host this live broadcast.